“People really appreciate home cooked meals. I had a friend who was going through a hard time so I was making them home cooked meals. I felt like I couldn’t provide much, but I could provide food”. Well known among her friends as a benevolent cook, Joyce is a generous and open person, with a passion for sharing her food. In fact, when I arrived at Joyce’s house, she had already prepared brownies to share with me while the curry was simmering. A Paediatrician by profession, Joyce spends much of her free time cooking and dividing the end result between friends, family and neighbours. Even the staff at her husbands bar; The Temperance Society in Summer Hill, benefit from her love of sharing; “On my days off, I like to cook and bake. I take a lot of it down to the staff at the bar so they can have dinner”. A frequent host of international cuisine themed dinner parties, Joyce is a considerate and accommodating cook who tailors meals to the suit the tastes and dietary requirements of her guests. Born in Penang, Malaysia, as a 17 year old Joyce arrived in Australia with her older sister. 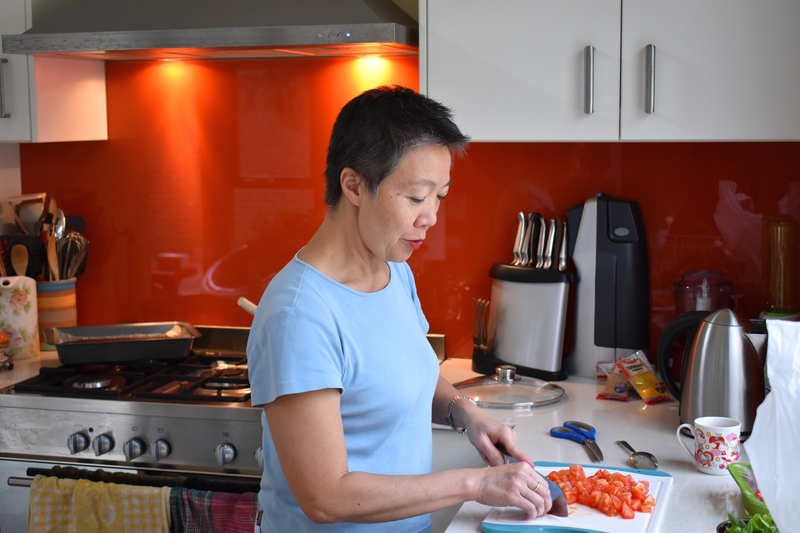 Thirty odd years ago, finding ingredients for Asian cuisine in Sydney was challenging, however Joyce and her sister would often make their own essentials; “My sister was a really good cook as well. I remember in the old days, before you could get noodles, we would make Chinese egg noodles with the pasta machine. We would even make our own tofu!”. In addition to sharing food, Joyce enjoys sharing her knowledge with others. With a house rich with cuisine related books, Joyce previously volunteered at her children’s school teaching cooking classes. An advocate of an educated diet, Joyce believes that teaching children to cook at a young age is integral to their future food choices, in addition to continuing the legacy of family recipes. “My mum was very much throw in a bit of this, a bit of that. I used to sit down and watch her. When you leave home, you think about what your mother cooks. And you think, how did she do that. How can I remember that? How can i recreate that? If you don’t keep it going, if you don’t get the recipes it’s not going to last”.